This intriguing curved roof house was constructed for fisherman Edwin Miller and his wife Priscilla. A fairly rare style of house, the form is concentrated in Trinity Bay around New and Old Bonaventure. Of the five remaining in New Bonaventure, it is the only inhabited house that has maintained the traditional windows and clapboard. With its curved roof the house is a rarity in both the region and throughout Newfoundland. The house sits on a triangular piece of land and in addition to the curved roof features a central chimney, traditional storm and screen doors, and a recessed front door with patterned glass window and decorated lintel and side panels. Inside, the house has a central hall, with parlour, large and small kitchens, and originally had four bedrooms on the upper storey, with one now converted to a bathroom. All the rooms with the exception of the entrance hall and the small kitchen have their original wooden ceilings. The foundation is a combination of the original wooden shores and more recent concrete pilings. The property has maintained the outhouse, cellar, and some fencing. The house was occupied by Priscilla after Edwin's death in 1942, and she remained in the house until the late 1950s. At that point the house was purchased by fisherman Sam Miller and his wife Theodocia. "Aunt Thea" was much loved in the community and well known for her hospitality, and older residents of the area still refer to the building as Aunt Thea's. Theodosia remained in the house until 1973, and she left the property to her son Giles Miller. In 1997 it was purchased by Helen Peters. Recently, the building was used a shooting location for "The Shipping News". The exterior was filmed as Jack Buggit's house and the interior was filmed as Dennis and Beatie Buggit's house. 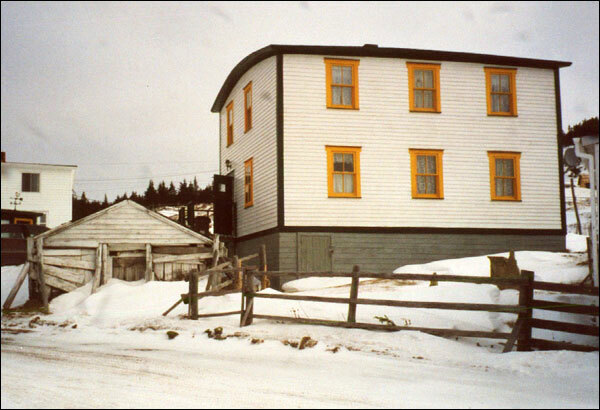 The Edwin and Priscilla Miller Property was designated a Registered Heritage Structure on March 27th, 2003 by the Heritage Foundation of Newfoundland and Labrador. It was recommended for designation as a representative example of a local vernacular architectural expression, and for the completeness of its historical context. Also view Edwin and Priscilla Miller House Registered Heritage Structure on the Heritage Foundation of Newfoundland and Labrador web site. The Newfoundland and Labrador Heritage Web Site has on its site only a portion of the registered heritage structures in Newfoundland and Labrador. To view a complete list or search for a particular structure visit the Heritage Foundation's Property Search page.